THE WINNING TEAMS OF THE GROUP ADVERTISING COMPETITIONS AS PART OF THE MEDIA CLUB & CCA INITIATIVE CONDUCTED ON 21 JULY 2012, WITH THE PRINCIPAL Mr.K.ALUNG KHUMBA , Vice Principal Mr B.MUNEEM, AND THE HOUSE MASTERS, HOUSE CAPTAINS, BOYS & GIRLS AND THE CCA COMMITTEE. Maligaon on 19th August 2012. 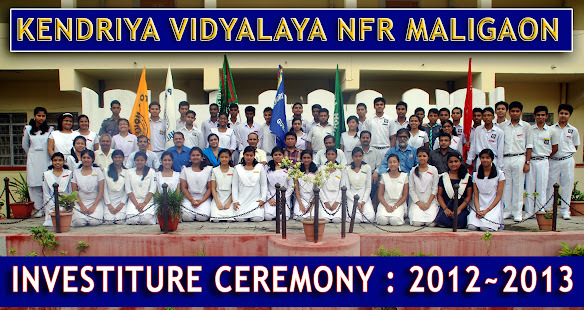 The Principal of the Vidyalaya Mr. Alung Khumba, Principal, K.V.NFR Maligaon, inaugurated the Exhibition of Photographs. The coordinator of the programme, Mr. Anutosh Deb, TGT (Art Education) felicitated the Principal. The programme was attended by a host of teachers, parents and students. To generate an interest in photography, a photography competition was organized at the Vidyalaya level. In group A from class VIII to X the theme was ‘World of Flowers’ in group B the theme was ‘Portrait’. Thirty students participated in the competition. The Principal announced the names of the 10 best entries. He also declared the exhibition open where photographs by students and teachers wise displayed. The Coordinator of the ‘Media club’, Mr. Anutosh Deb in his deliberation enlightened the gathering on the reason for celebration of 19 August as the World Photography Day and a peek into the beginning of Photography and modern initiatives in DSLR photography and encouraged the students to expose themselves to the art of photography, learning the nuances of the Art. Mr Rajendranath U. PGT Physics also shared his experience in Photography, and also suggested that Photography techniques play a very important towards utilization of the medium in the best possible way. He also lauded the initiative of the Photography club. The students also expressed their thoughts on the launch of the photography club in the school. Master Nihar Bhardwaj of Class X spoke about how Photography helps to relate to the real life situation and increases keen observation skills and understanding of nature and life around us. Miss Indrani Das, a student of Class XII also spoke on the experience of shooting portraits and the challenges she faced while shooting portraits. The exhibition was open for a weekend and it evoked appreciation from parents. The Officials of Nikon India Private Limited visited the exhibition and appreciated the principal, the coordinator and the students of their efforts in photography. mementoes, to the 10 best entries. The certificates were presented by the Hon’ble Assistant Commissioner KVSGR Mr.A.V.L.J.Rao, on 04 September 2012, during the Annual Academic Inspections 2012.